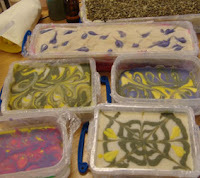 Gracefruit.com - Making Soap, Living Well: Soapmaking Course in Scotland! My friend Sarah of The Soap School will be travelling to Glasgow in June to teach three soapmaking courses. The centrally-located venue is in the beautiful West End of Glasgow at the Argyll Hotel. The hotel has a sister guest house opposite offering rooms from only £35 -- great for anyone coming for the full weekend. Please contact the Argyll Hotel directly regarding accommodation. Full details of the Scottish soap courses can be found at Sarah's website. Or you can ring Sarah between 8 a.m. and 8 p.m on 01484 310014 or email sarah.janes3@ntlworld.com any time. Spaces are limited, so book now to avoid disappointment. Wow, soaps that look good enough to eat. Since I am in the US, I'm afraid Scotland is too far away for lessons, but I admire your work and have enjoyed reading your site. Great work, your very talented.